I was in a crummy mood when I went to Pirates of the Caribbean, and afterwards, my spirits still had not been lifted. After the screening I heard people comment that the movie was “fun” and “entertaining,” and I agree that it was the type of movie that tries hard to entertain — a bit of humor, a sprinkle of adventure, the odd explosion. If that suits your mood, you’re sure to enjoy yourself. But if you’ve seen this type of summer fare as often as I have, and if you’re the least bit unreceptive, you might just find Pirates of the Caribbean tedious. The Mexican, Verbinski's latest "light" movie. Johnny Depp is Jack Sparrow, a lovable pirate in black mascara. Depp gives Sparrow a gay, poncy sort of a walk, a flair for the theatrical. Orlando Bloom and Keira Knightley are the straight-laced, star-crossed lovers. Jack Davenport is the closed-minded, antipiratical British commodore who also vies for Elizabeth’s (Knightley’s) hand. 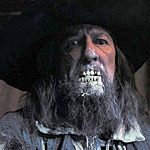 And Geoffrey Rush rounds out the cast as Barbossa, leader of the cursed, undead pirate crew what left Sparrow for dead. Around these archetypes, and borrowing a title calculated to sell trips to Disneyland (the movie is “based on” the ride of the same name), a story is built. The undead pirates once stole golden Aztec medallions, which were cursed by the old gods. To lift the curse they must recover all 882 medallions and place them back in their chest, along with the blood of each man who stole them. The young lovers are involved because one of the medallions has come into their hands. The commodore and the British Navy are involved because it wouldn’t be a pirate movie without the threat of the gallows. Verbinski is the right director for “fun” and “entertaining” movies. Before Pirates of the Caribbean he put his smiley face on Mouse Hunt and The Mexican (and made a passably good PG-13 horror film in The Ring). He shows off his special effects — moonlight shows the undead pirates as they truly are — without flaunting them. If I were looking for an adventure movie to take my not-too-young kids to (there are some off-camera throat-slittings), I would consider Pirates of the Caribbean. But don’t expect too much from this empty, hollow movie. The only characters who are allowed to have any character are the pirates (Rush and Depp are captivating). There is no emotion behind anyone’s motive, and no moral to the story. I can’t imagine anyone expecting more from a movie called Pirates of the Caribbean, so chances are, nobody will be disappointed. On the other hand, not everyone will enjoy it.